In this Dec. 19, 2018, file photo, former first lady Michelle Obama responds to questions as she is interviewed by actress Sarah Jessica Parker during an appearance for her book, 'Becoming: An Intimate Conversation with Michelle Obama' at Barclays Center in New York. 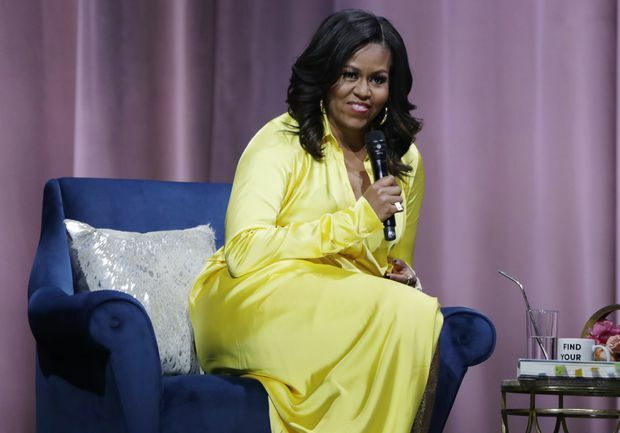 There’s a point in Michelle Obama’s onstage book event where she discusses the feelings of self-doubt and fears of inadequacy she experienced toward the end of high school, a story she also recounts in her memoir. She was an excellent student, with nearly straight As, class treasurer, on the honour roll. Yet the school guidance counsellor discouraged her from applying to her first choice, Princeton. What else could the issue be, other than the colour of her skin? That brief but obvious reference to the recent college admissions scandal was one of the few moments Ms. Obama strayed from talking about her life – the subject of her bestselling memoir, Becoming – and dipped a very cautious toe into turbulent current events. “There is a lot of unfairness in the world. The world doesn’t operate as a complete meritocracy. You know, there are people who get where they [are] not because they’ve earned it or they deserved it, they get it because they’re rich or they have prestige,” she said. She was talking about her own observations at Princeton, but the recent cheating controversy was top of mind. The audience – a packed crowd at Vancouver’s Rogers Arena – voiced their admiration with laughter, applause and hoots of approval. Ms. Obama is on an international book tour that feels more rock concert than literary affair. While the meat of the event is an onstage interview – conducted in Vancouver by Good Morning America host and Ms. Obama’s friend Robin Roberts – it was preceded by a feel-good slideshow featuring photos of Ms. Obama with everyone from the Pope to Big Bird. There was also a slick video, which included interviews with Barack Obama and their children. It was all set to music, including songs by Lady Gaga, Whitney Houston and the Jackson 5 – perhaps programmed before allegations of sexual assault were made against Michael Jackson in the recent HBO documentary Leaving Neverland. There was almost no Canadian-specific content in Ms. Obama’s interview, although she did express admiration for Vancouver, which she called “one of the most beautiful places on Earth. While she never mentioned the current U.S. President by name, it was clear that Ms. Obama was referring to Donald Trump when she talked about her family’s experience in the White House in contrast with the atmosphere of the place these days. Ms. Obama said it was essential to make life there fun – not just in spite of but because of what the Obama administration was facing as it came to power. Mr. Obama was cleaning up a mess, she said, with two wars and the financial crisis. “The country needs to see joy in the people’s house. They need to see children playing and laughing on the South Lawn. We need to be reminded of that optimism and hope, even as we’re fixing all that is broken. I felt it was an important symbol to show the people of the nation, of the world a garden in the White House, with kids planting and pulling vegetables and cooking and laughter. “You know, we needed that house to be happy. Because we see now how it feels when there is no joy,” she said to wild applause. Becoming: An Intimate Conversation with Michelle Obama is in Edmonton on March 22, Montreal on May 3 and Toronto on May 4.